Some folks have found that the whole idea of paring down possessions in anticipation of living aboard a boat too difficult to deal with. I can well understand the trepidation. There are ways to do this de-cluttering, and they are not too painful, if taken in logical, sequential steps. I did it, and you can too. Rosemari said: "It seems that is all I think of, now comes the big part what do I keep and what do I sell. It seems too much to comprehend. Anybody got any ideas on how I can start to tackle this?" The keep versus sell or dispose of is one thing I've done. For me, the deciding factor in any item was "Did I LOVE it?" and if not, it went. Gradually many of the loves became "not really" and even a few of those "what was I thinking?!" Tastes change. Mine did. Years ago I was a Paula Vaughan stitching fan. She does big beautiful pictures that look like paintings. 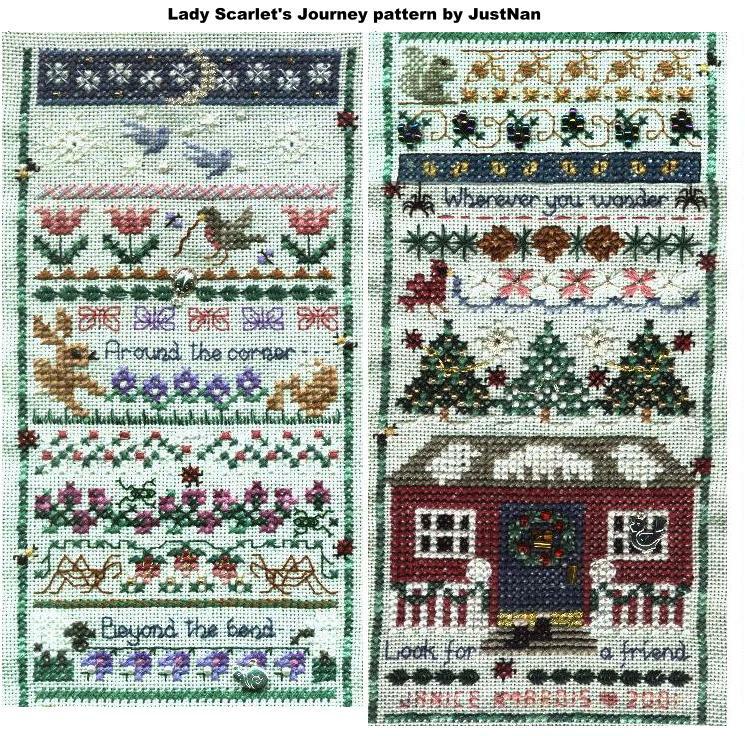 Then a gal named Kathy introduced me to samplers and smaller designs. I was hooked! So initially, start to cherry-pick your favorites. You'll definitely want to keep those. The rest set aside to either give away or sell later. 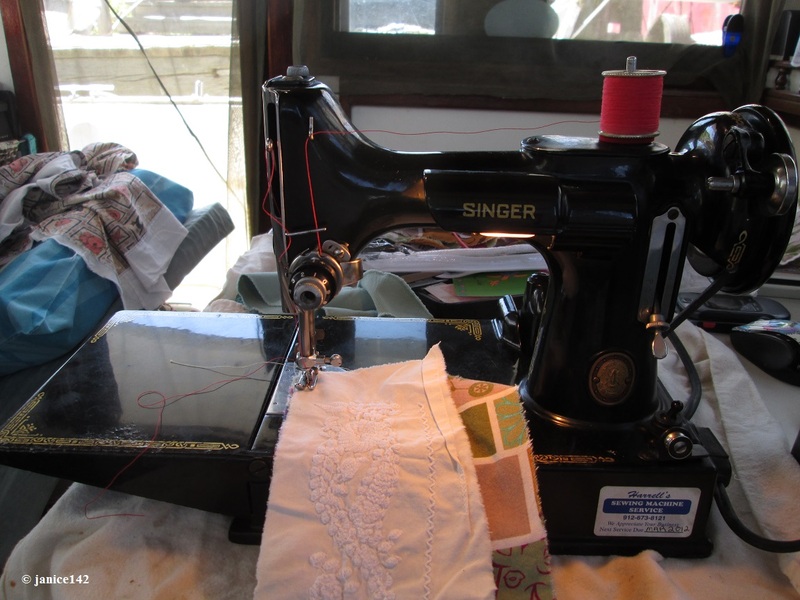 Aboard Seaweed, I have a 1937 Singer sewing machine, the 221 Featherweight. The Featherweight is something I loved. I enjoy quilting and creating. That said, I'm not very good at sewing. Still, it brings me pleasure. Thus I saw no reason not to have the sewing machine aboard the boat. fits someplace on the vessel call it boat gear and put it away. Properly stowing items is important as boats move. Things have to be put away especially if you want to go on a cruise at the spur of the moment. You might be sitting around on the boat one morning. The skies are clear and the water calm. Why not simply go for a boat ride? If your boat is relatively tidy, you can do so with ease. 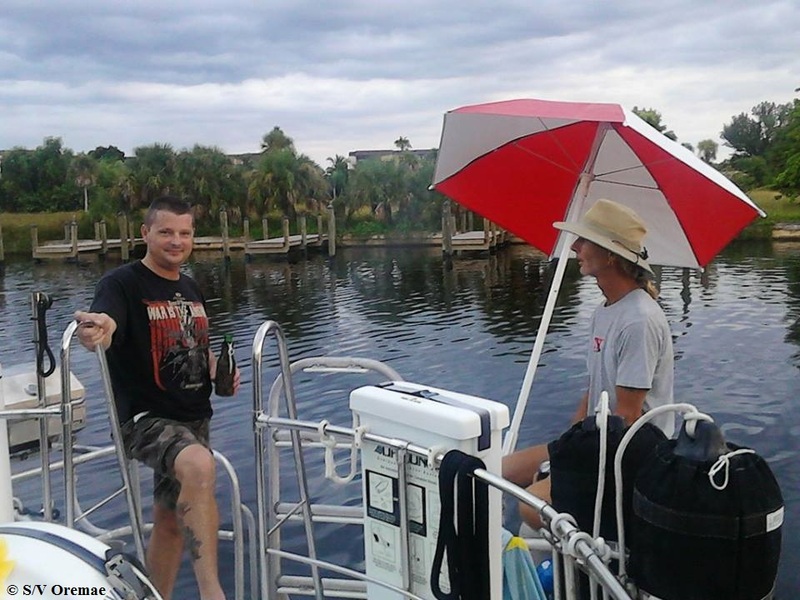 If it's work to get ready to leave the dock, you won't do it nearly as often as you might think prior to living aboard. It is all too easy to get complacent and not use your boat. Do make the effort to take her out for a spin at least weekly. It's good for you, your soul, and who knows? You might just meet someone interesting out there. Mermaids exist, or at least pretty girls who go swimming. You won't meet her at the dock tied to an electric cord. Did old friends stop by to visit? Why not take them on a short cruise? Anchor out, fish, grill your catch and then head back to the marina. Life is about good times with good friends. As a kidlet aboard our 40'er, we were always ready to leave in 15 minutes. It was one of Daddy's rules. If he said we were leaving we did so, quickly and with no nonsense. With Seaweed I've done the same. When the engine ran back in the good old days before this engine swap began, I could haul in the anchor and move to a spot for swimming with minimal effort. I loved that freedom. Soon the final hoses will be on the 18 hp Kabuta from Yanmar Tractor Parts and the sensors attached. Then once again I'll be mobile. And gosh, that will be good. I'm looking forward to being able to take the boat out to Dog Island to go swimming. I've missed that. Or up the river should a hurricane come this way. Hurricanes worry me, especially with a boat that cannot move under her own power. 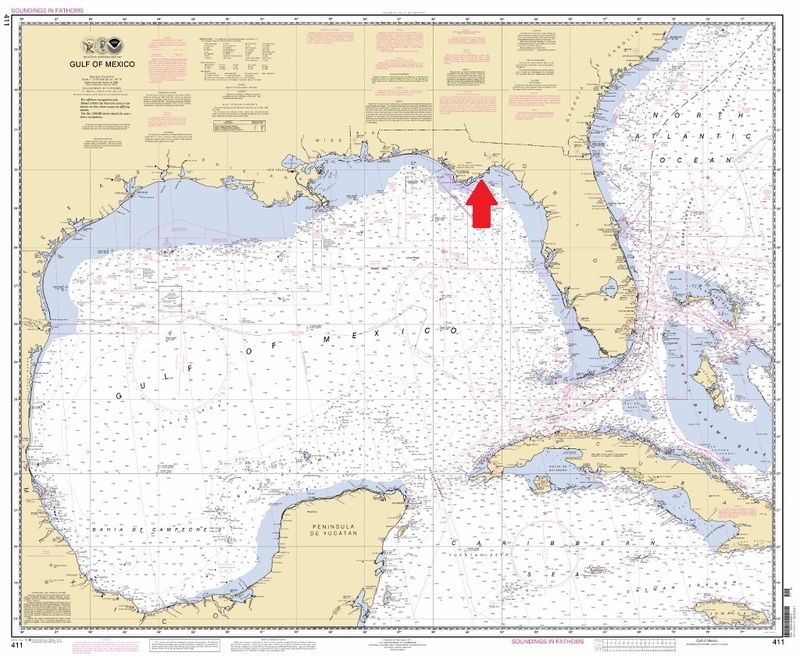 Dog Island is a barrier island just south of me. Yes it is difficult... however if your "stuff" is not creating the home you wish to live in, then get rid of that stuff! Simply pick the very best or most used items and keep those. The rest is clutter and needs to go. For instance, I know of no one who does not have at least a half dozen towels with stains or just not liked any more. Yet they still exist in the overstuffed linen closet. Why are you keeping sheet sets you don't like? How many containers do you have in the kitchen without lids? All of that and more is cluttering your life and mind. Plus it's a responsibility. I'm happier now than I ever was in that three bedroom and two bath house crammed to the gills with Junk. My world is restful and tidy. Yours can be too. Start in the kitchen, removing each item from one cabinet at a time. If you like it put it back. Otherwise, out it goes. Separate the stuff leaving into bags for trash man, donation or potential sales. And yes, it really is that simple. ONLY put into your lockers that which you love. Do not worry about having enough dishware if company comes over. Use paper plates and call it good. These are friends or relatives. If they judge you poorly because of your dishes, why are you being nice to them? You can do better. If you love it, it's a Keeper. Otherwise, it's got to go. My bedroom (which would have been a disaster during the cleanup as I know stuff would migrate there until either put away or tossed or donated. The garage is a whole 'nother matter. IF you've one, then boxing up stuff for there from the 1-7 items would be fine IF each day you deal with one box -- Monday thru Friday. Weekends are not for work unless you wish it so. I guarantee you'll be happier than you can imagine with less stuff to deal with. 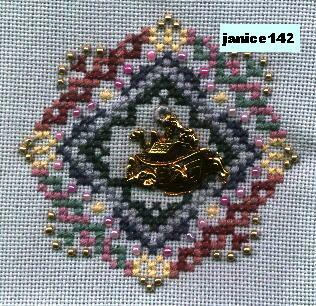 Truly I love pulling out my threads when stitching now more than ever before. Silk floss is wonderful and such a dream when compared with the cotton threads I used to use. And I'm not saving it for later either. It's mine and I'm enjoying it now. Ditto my nighties. The fancy ones are fabulous today. Sheer, lacy and very pretty. If they wear out, well, I'll get more. Presuming I can get into a thrift store some day. I dream of those shops too. Once you have less clutter in your life you'll be more ready than many when you finally find that ideal boat. I wrote a series of articles about this for my website. The page is found here: Becoming Clutter-Free. The items on that page offer specific detailed advice that others have used successfully. I did it, others have followed my method, and you can do so too. Seriously, anyone with determination can accomplish this clutter-free life. But take small bites. As you proceed I suspect the momentum will build. At first though, the job can be daunting. Give yourself time and know that out here afloat on even a small inexpensive boat life is grand. I am so glad I am no longer owned by my Stuff. Part Two of the query regarded what to sell. That's the conundrum I ran into also. In the next article I'll cover that in detail, along with where I sold my unwanted items. I'd love to hear what you LOVE and have decided to keep. And, are you surprised by some of the things you'd forgotten you owned? A favorite aphorism: No matter how long or how hard you shop for an item, after you've purchased it, it will be on sale somewhere cheaper.